There is growing interest in the use of diverse forage mixtures (also called herbal or multispecies leys) as a method of enhancing agricultural production while providing environmental benefits. Soil improvement – deep-rooting leys break up compacted soils and transfer carbon from the atmosphere to the soil, improving soil structure and moisture retention. More diversity in leys increases the diversity of soil biology, improving nutrient cycling (Enhancing soil biology). Reading University, in partnership with Duchy College and Rothamsted Research, is running the Diverse Forages Project. This aims to research the suitability of diverse forage mixes for agricultural productivity and positive environmental impacts. The project will investigate forage quality, yield, nutritional value, species composition and soil properties from three forage mixes and a ryegrass control grown on a network of farms. This farm network will allow differences in management and local climate to be assessed, in order to understand how best to manage diverse forages. For a detailed guide to forage species and how to grow them, see the Sustainable Forage Protein project. This summarises farm trials run by Aberystwyth and Bangor Universities, Waitrose, Germinal Seeds and Innovate UK. Diverse forage mixtures tend to have small seeds and as a result require a fine seedbed. Seeds can be broadcast or shallow drilled and it is crucial to roll the seedbed thoroughly after planting. Diverse forages are best managed through rotational or mob grazing, this leaves plenty of leaves and soil cover for fast regrowth. Set-stocking can lead to selective overgrazing, lowering the plant diversity of the sward. Learn more about herbal leys with Cotswold Seeds. 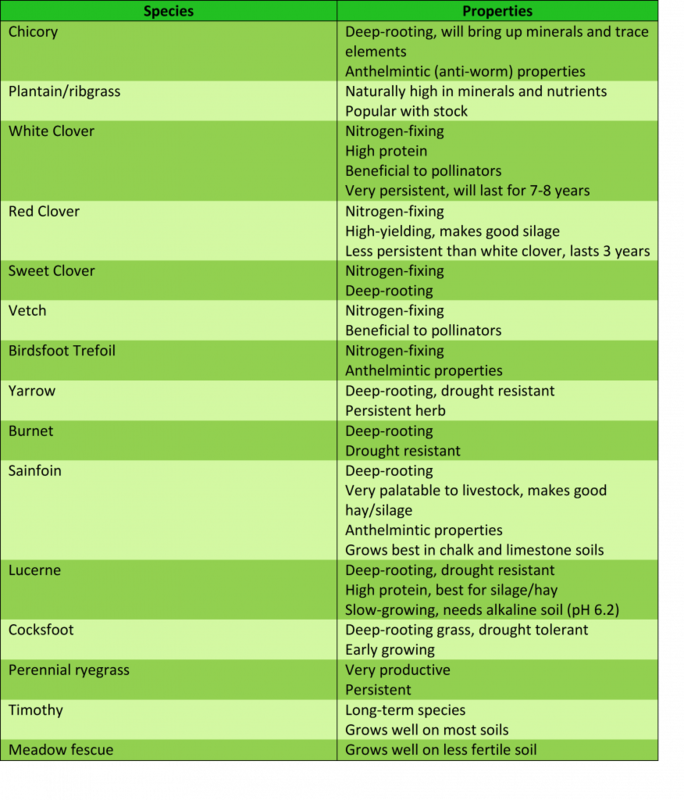 Agri-tech Cornwall is running the “Toolkit of Multi-Species Swards” (TOMS) project through Duchy College and Rothamsted Research North Wyke. This will support the growing interest in multi-species leys by trialling mixes and management technique, with the aim of producing an online toolkit to help farmers make informed decisions.